Living in a modern society, we are all becoming aware of the needs to protect the planet and the future for our children. This is one point of view. The other point of view is, how on earth can I keep paying these utility bills when the energy and water companies keep hiking the prices up? The solution is to become more self sufficient. We can help to design, supply and install new " green " technologies into your property, no matter how old your house is or how much room you may have. 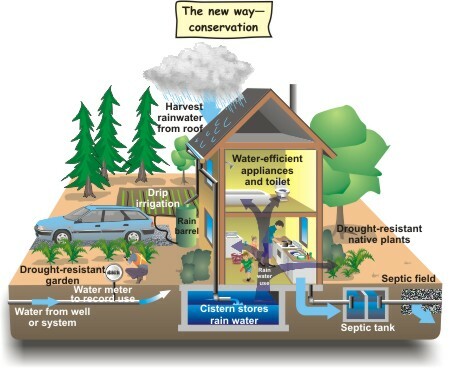 Try recycling rainwater to use in your toilets or to water the plants, or upgrade your septic tank to an environmentally friendly sewage treatment plant which will clean your waste enough to discharge into a watercourse. We have the solution which we can specifically design for each individual customer. We are finding that more and more new build properties are encompassing these technologies during the construction phase. Rather than moving into one of these properties, why not let us convert your current house into an energy efficient one?